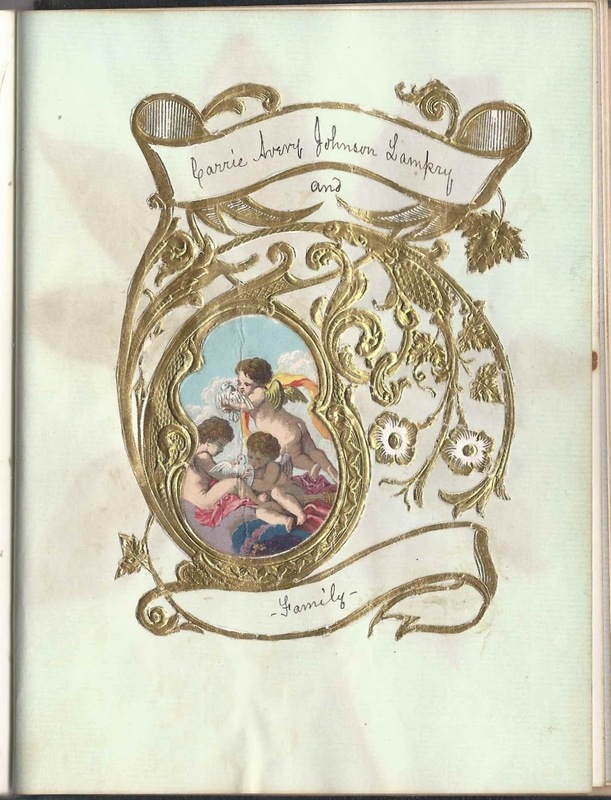 1862-1864 autograph album of Caroline Avery Johnson, "Carrie", from before and after her marriage to Morris Jenness Lamprey. 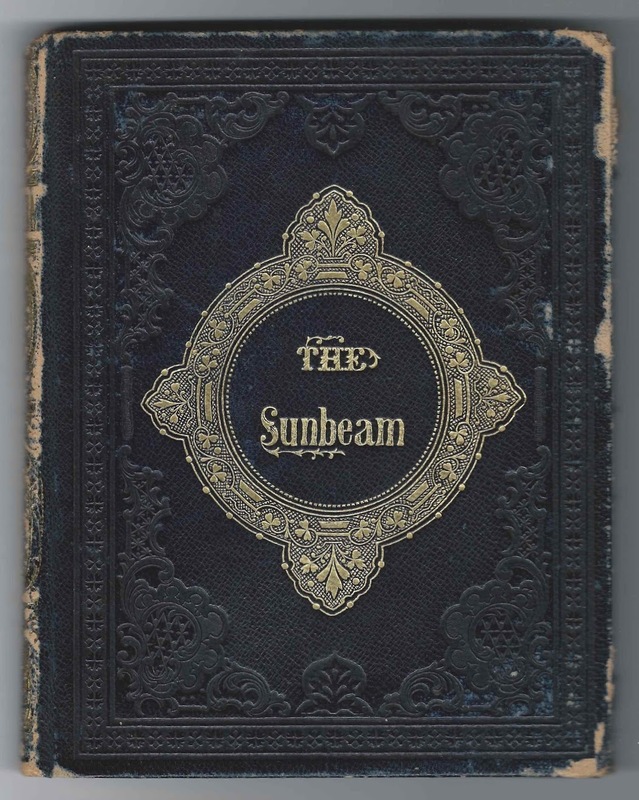 The "Sunbeam Album" was printed in New York by Leavitt & Allen and contains several engravings throughout, as well as an image of a flower that appears to have components that were pasted on the page, either by the printer or perhaps later by Carrie. 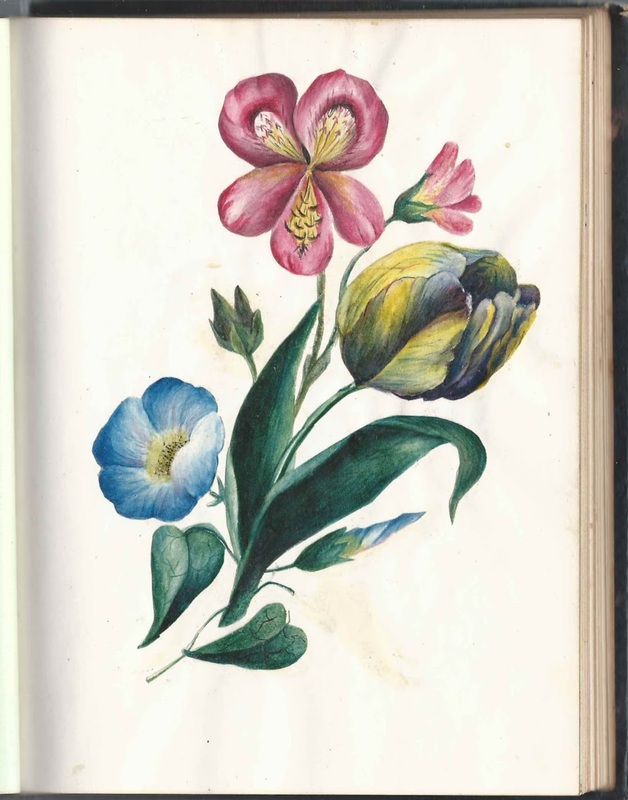 Carrie also pasted flowers and what appear to be herbs or seaweed in the album. 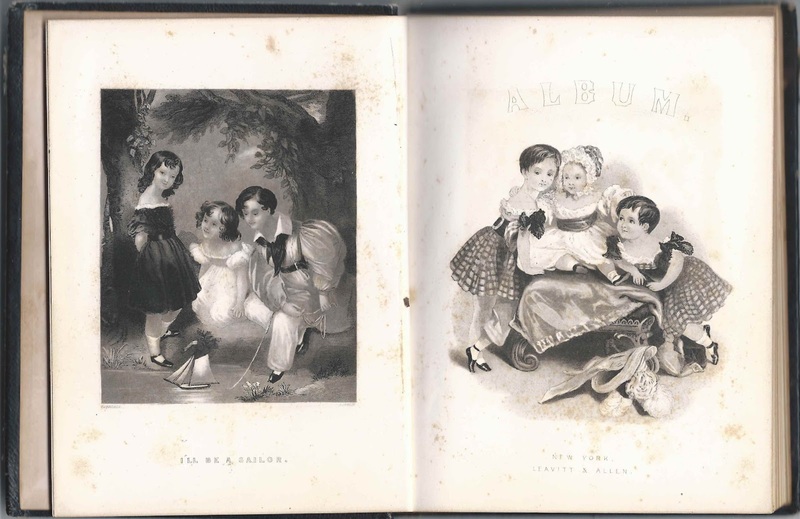 The album measures approximately 7" x 5-1/2" and contains the sentiments of 13 of Carrie's relatives and friends. An alphabetical surname list and alphabetical list of signers, together with any personal information they offered, appear at the end of this post. Caroline Avery Johnson, "Carrie", was born about May 1838 at Greenland, New Hampshire, the daughter of Charles B. Johnson and Martha Jane (Avery) Johnson. On June 1, 1863 at Greenland, New Hampshire, Carrie married Morris Jenness Lamprey, son of Hezekiel Buzzell Lamprey and Mary Ann Elizabeth (Jenness) Lamprey. 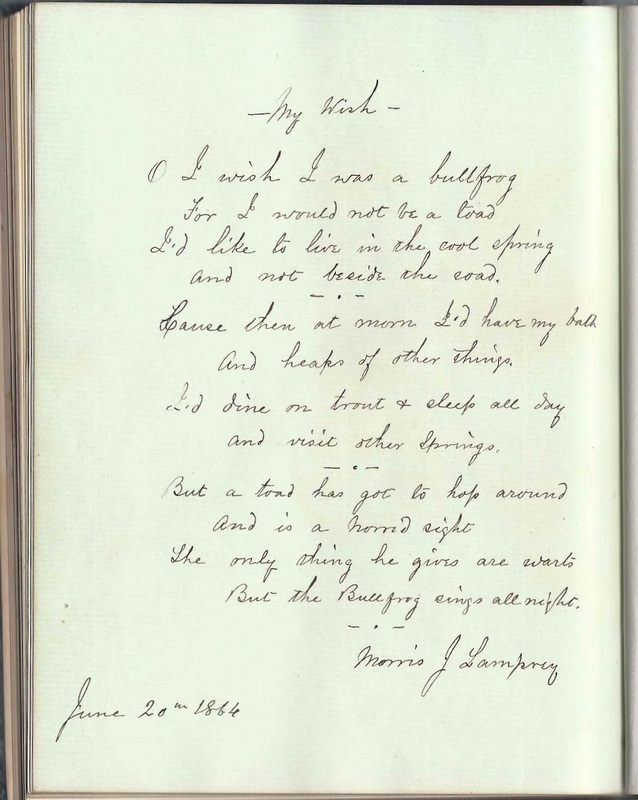 Morris signed a page in Carrie's album on June 20, 1864. By the time of enumeration of the 1900 Census, Carrie, Morris and their daughter C. Belle Lamprey, perhaps Carrie Belle Lamprey, born about 1867 in New Hampshire, were living at Melrose, Massachusetts. Morris worked as a machinist. 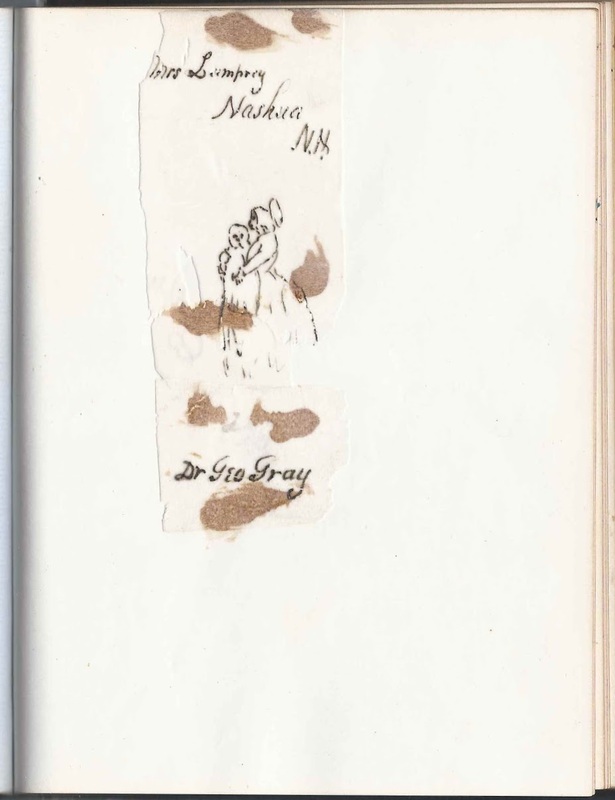 There's a scrap of paper in the album with a drawing by Dr. George Gray of a woman and child, labeled as "Mrs. Lamprey". Could this be a drawing of Carrie Avery (Johnson) Avery and baby Carrie Belle Lamprey, perhaps while they were living or visiting at Nashua, New Hampshire? There was a Dr. George Gray at Nashua, born April 29, 1829, son of John and Hersina (Knight) Gray. Read more about him and see an image of him here. Morris Jenness Lamprey died at Melrose, Massachusetts, on January 21, 1917. Carrie died there the following year. Melrose directories have listings, under the heading "Illustrator", for C. Belle Lamprey and Belle Lamprey. Presumably she is the artist whose painting appears in this brochure from the "Melrose Mirror". See another Belle Lamprey painting here. 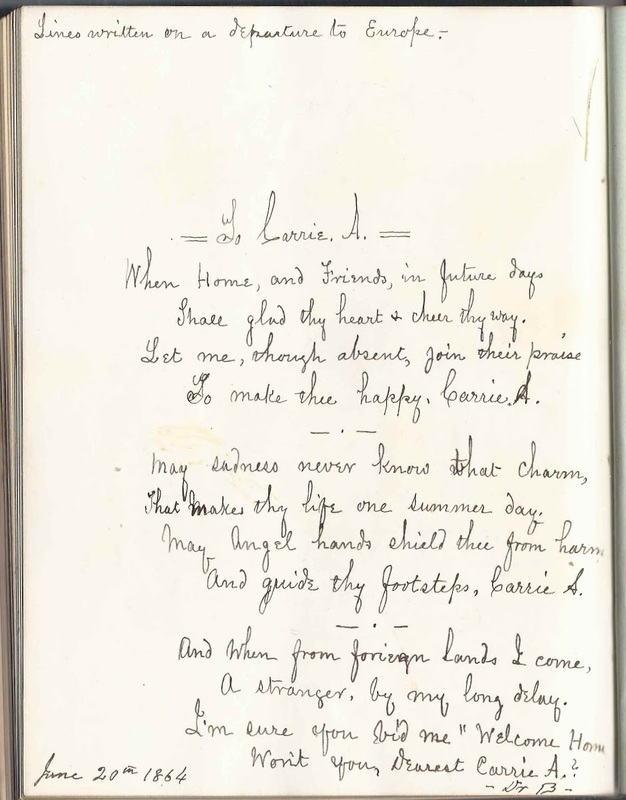 One of the more interesting features of the album is a two-page spread where Dr. B. is leaving a sentiment to Carrie, whom he calls Carrie Avery Johnson Lamprey, as he is about to embark on a journey to Europe in 1864. It's intriguing to think of what his travel purpose might have been during such a difficult time in the United States. 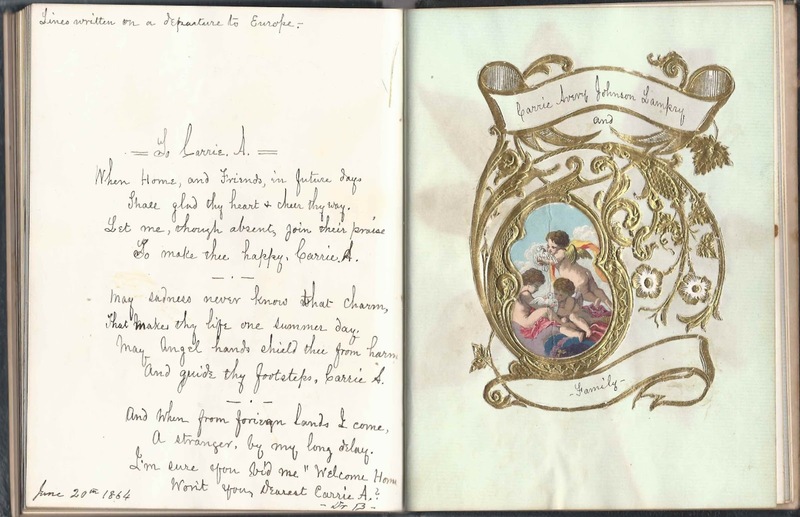 Facing pages with a sentiment on left and a design on right, inscribed by Dr. B., who was about to depart for Europe. William Henry Augustus Mephistophilus Collins, M.D., A.B., LL.D. Not sure if William is his first name or if what I thought was Wm. was actually another abbreviation. There was a Dr. Henry Augustus Collins who practiced at Springfield, Massachusetts. 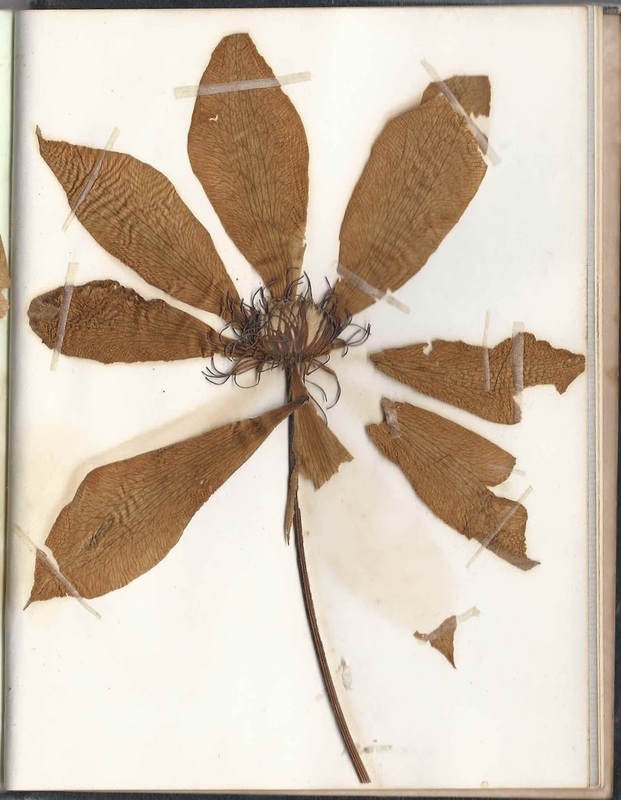 Mary V. Dearborn, signed at Greenland, New Hampshire, on February 5, 1864. She would marry Charles W. Marden in 1867. Morris J. Lamprey, signed on June 20, 1864. He and album owner Caroline Avery Johnson were married on June 1, 1863 at Greenland, New Hampshire. Mrs. Seddie E. Williams, signed on June 14, 1864. Someone, possibly Dr. C. or Dr. G., wrote a nice sentiment about Seddie on June 20, 1864. If Dr. G, perhaps it was Dr. George Gray.